One important agenda of Caroline Christov-Bakargiev’s documenta 13 (mentioned in the first lines in the accompanying guidebook) is described as ‘ecofeminism’. In her book Le Feminisme ou la Mort (1974), Françoise d’Eaubonne uses this term first and called upon people to lead an ecological revolution in order to save the planet. This entailed revolutionizing gender relations and human relations with the natural world. The microcosm of the home and the macrocosm of the world recognize two realities; the overwhelming presence of patriarchal societies and the subjugation of nature on a global scale. This suggests that the coining of the term was not meant to posit an inherent connection between women and nature but to suggest a disproportionate subjugation of both. 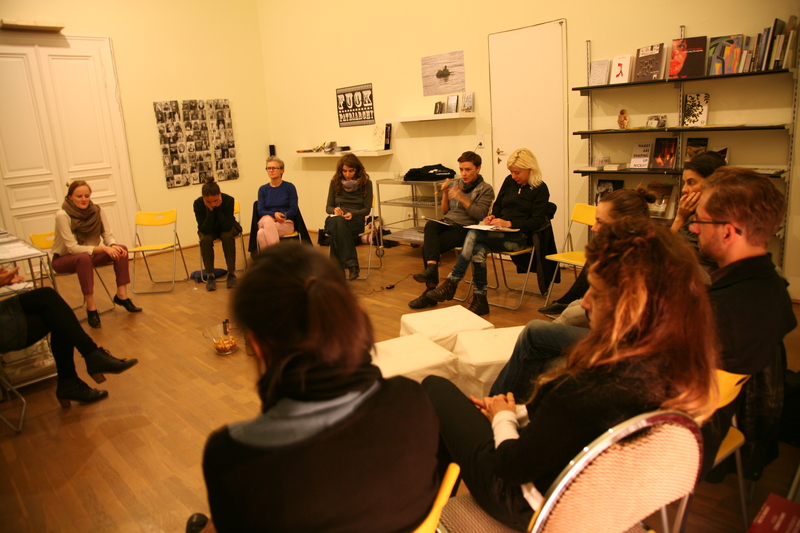 Although the eco feminist agenda can be felt in many decisions concerning the theoretical backgrounds, the presentation and the assignments given to artists in this documenta, there aren’t many works of outspoken (eco) feminist artists criticizing harsh conditions for females in patriarchal societies nowadays (think of sexual exploitation, human slavery, difficulty of double burden of job and motherhood, lower wages for female workers, low self esteem of young girls, etc.) Even the amount of female artists participating (around 30%) wasn’t really higher then in similar shows like this. How do/can feminist cultural workers support each other globally, which issues should they address nowadays and which difficulties do they come across? This entry was posted in EXHIBITIONS, TAZ - ff - 2012, Uncategorized and tagged Bettina Steinbruegge, Galerie Lisa Ruyter, Nina Höchtl, panel discussion, Rita Vitorelli, Ursula Maria Probst, Vienna on September 24, 2012 by lisa.